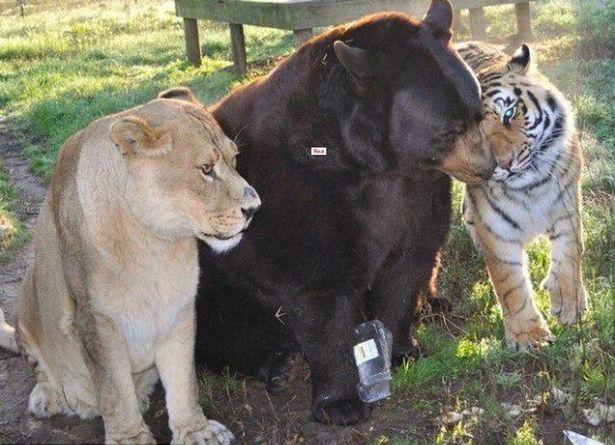 A tiger, a lion and a bear make up a group of unlikely animal friends - who bonded over their harrowing start in life. The trio of pals, also known as "The BLT", were brought to the Noah's Ark Wildlife Sanctuary in Georgia, in 2001 when they were found by police in a basement in Atlanta during a drugs raid. The three cubs were malnourished and underweight after they were found cowered in small cages underneath the house. Shere Khan, the tiger, was skin and bones and infected with internal and external parasites when he was rescued. Leo, the lion, came in with an open, infected wound on his nose from where he had been confined to a small crate. Baloo, the bear, was in the worst state, with a severely ingrown harness digging into his flesh because it had not been loosened as he grew in size. But after expert care and plenty of good food, the trio were soon happy and healthy again. And to the zookeepers' surprise, the pals formed a tight bromance, meaning they have been inseparable for the last 15 years. You might say they're the ultimate brothers from other mothers. Noah's Ark Sanctuary said: "Baloo, Leo and Shere Khan eat, sleep, and play together and even seek out grooming and affection from one another, head rubbing and licking each another. Their terrifying early months in life bonded the three together and they are truly inseparable despite their obvious differences."